Galicia (Spain). However, it’s not a staple dish in the former Portuguese colonies. Day or during the Holy Week. It’s also a very common dish on Good Friday. Some say there are 365 ways of cook bacalhau, one for each day of the week. lot of recipe variations, depending both on the traditions and regions. 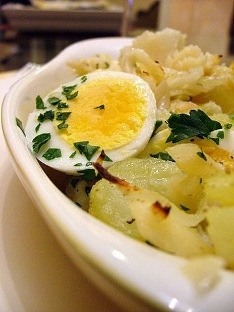 Bacalhau is usually served with potatoes. Wine always accompanies the dish. 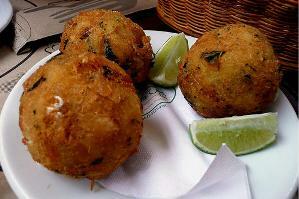 Bacalhau à Gomes de Sá is one of the most popular ways of cooking salted fish. Brazil, served along side with beer. if you plan an ethnic dinner, why not try this savory Portuguese dish? slices, 8 hard-boiled eggs for garnish and a dash of white paper. halves, some olive oil and parsley. Enjoy!